Typhoon Haiyan absolutely decimated the Philippine city of Tacloban. Right now the death toll estimates are wavering in the thousands, but the number of survivors is exponentially more. They lack food, water, and medicine. And luckily, the US Navy has a massive ship that can get it there. After the storm bulldozed its way over the southeast Asian island nation, outpourings of support came in from around the world. The Australians threw in $28 million. The Japanese, $10 million. Hell, even Ikea, yes, the furniture store, that Ikea, the one with the meatballs and the fish eggs that come in a tube, kicked in $2.7 million. The American government pledged $20 million in support, but also something that no other nation can provide. An aircraft carrier. Specifically, the 116,700-ton, 1,092-foot long USS George Washington. Although an aircraft carrier is primarily thought of as a weapon of war, it's really just a big floating airport, complete with runways, air traffic control tower, and a big hangar. But below those decks lies essentially a city, with all the services a city can provide. Water, fuel, food, and medical facilities are the primary use of an aircraft carrier's "soft power." F/A-18E/F Super Hornets, Phalanx Close-In Weapons Systems, and EA-6B Prowlers are the primary weapons of a modern Nimitz-class aircraft carrier. And when it comes to international disaster relief, they are pretty much useless. Completely crap. 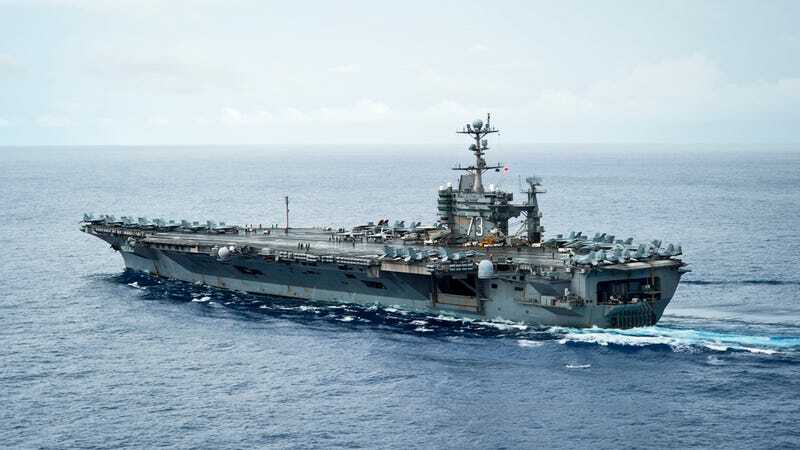 They provide defense for the carrier itself in a time of need, but that's about it. You could strap water tanks to a Hornet and fly it in a couple gallons at a time, but that would be silly and pointless. No, the real stars of this one are the support planes. They're not so glamorous most of the time, but the Navy's C-2 Greyhounds can carry over 10,000 pounds of cargo in each run, which enabled the George Washington to start ferrying supplies over before it even arrived on station in the Philippine Sea on Thursday. Two of them are based with every Carrier Strike Group, so they can ferry goods around the clock. Also with the CSG are 21 Seahawk helicopters, which can lift cargo, and V-22 Osprey tiltrotors which combine the aspects of a helicopter and a traditional plane, turning their engines for forward flight. Each one of those can carry 20,000 pounds of internal cargo. That's pretty much the weight of a school bus. Water is one of the main issues in the wake of a typhoon like the one that hit last week. Sewage systems can be backed up or completely ruined, dead bodies and debris contaminate traditional sources, and without water the human body will expire after only a week. The GW is powered by two nuclear reactors, however, each of which normally desalinates water for the 5,000+ crew. The ship itself is capable of outputting much more water than it needs, though, so all it has to do is load it up onto helicopters and get it over. Oh, just how much water, you want to know? 1,500,000 liters. Every single day. Most of the space onboard the carrier is reserved for planes, berthing quarters, equipment, and those big reactors, so there's not always a lot of space to store the food for everyone. Enter the USNS Charles Drew. Think of it like the carrier's backpack shoved full of food (and usually, ammunition as well). Accompanying the George Washington down to the Philippines, it can carry 1,388,000 cubic feet of dry cargo, with further space set aside for 23,000 barrels of fuel. One of the weird little upsides of war, if there ever were any, is that every big ship you build usually comes with a fully-functioning hospital inside. The US already has dedicated hospital ships already, such as the USNS Mercy, which is on its way to the Philippines right now. The George Washington had the geographic advantage of being homeported in Japan, and of being in the middle of a visit to Hong Kong when the typhoon struck. While the Mercy makes its way over to Asia, the GW will have to do. The carrier already has a 51-bed hospital ward, a three-bed Intensive Care Unit, an X-ray lab, basic laboratories, a surgical suite, and plenty of medical supplies. Oh, and it's also got five dentists, who have complete facilities of their own. In case anyone needed a filling. In total, the USS George Washington is bringing not only itself, but also the cruisers USS Cowpens, USS Antietam, the destroyers USS Lassen and USS Mustin, the Charles Drew, the survey ship USNS Bowditch, and submarine tender that services submarines that may or may not be with the carrier group at all times (hint: they're with the carrier group at all times). All that, and, oh yeah, that $20,000,000. Most of the time, our government is crap. Every so often though, it does get things that just work.